Of people who both blog and tweet, the majority would overwhelmingly prefer to have more blog readers than followers on Twitter. This is according to surveys conducted by Darren Rowse who runs ProBlogger and TwiTip. 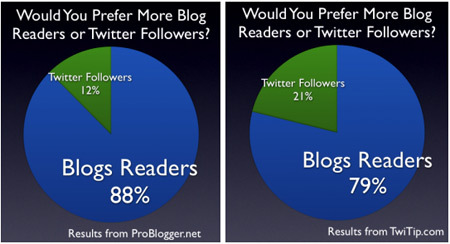 Would you prefer more blog readers or Twitter followers? Tell us. This is not entirely surprising, since generally, much more effort is put into a blog post than a 140-character or less tweet, but there is certainly a gold-rush for Twitter followers. Jason Calacanis for one is willing to pay a pretty penny for them. – they are most likely not going anywhere, while Twitter may be hot right now, but who knows where it will be in the future? There are obvious benefits to having Twitter followers too though, particularly for marketers. Of course people who both blog and tweet know they don’t have to choose between one medium or the other. They compliment each other, and ideally can work to each other’s benefits. Twitter can gain you more blog readers, and a blog can gain you more Twitter followers. It’s all in the execution. Write good content that Twitterers want to link to. This has plenty of potential for getting you more readers. Include chiclets on your posts, making it easy to share your content (this shouldn’t be limited to Twitter). Include a prominent link for people to follow you on Twitter (a Twitter logo here will help draw attention). Link to good content from others when you Tweet. If people like what you’re pointing them to, you’ll likely gain more followers. Who would’ve guessed it all comes back to content? You could also mention your blog casually from time to time. This may increase awareness of it. Just because someone follows you on Twitter, does not mean they know about your blog. That said, you probably don’t want to ram it down their throats either.